Loews Corporation (NYSE: L) stock fell over 6.1% on Feb 11th, 2019 (as of 11:41 am GMT-5; Source: Google finance) after the company reported a loss of $165 million compared to net income of $481 million in the prior year period. The loss during the quarter is driven by catastrophe losses at CNA Financial Corporation, investment results at both CNA and the parent company, and operating results at Diamond Offshore Drilling Inc. The $200 million net benefits from the Tax Cuts and Jobs Act of 2017, included in the results for the three months ended December 31, 2017, contributed to the quarterly and annual year-over-year declines. Diamond Offshore’s net loss increased by $6 million in 2018 as compared to 2017. 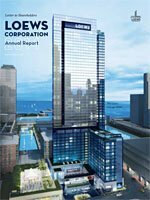 The net income in 2018 increased as a result of Loews now owning 100% of the company as compared to 51% in the prior year period. This increase was partially offset by lower net transportation revenues, resulting primarily from a contract restructuring and reduced rates on renewing contracts, offset in part by revenues from growth projects. In 2018, CNA has generated underwriting losses in its core property & casualty business, as compared to underwriting gains in 2017, resulting from higher net catastrophe losses, lower favorable prior year development and a higher underlying loss ratio. CNA’s non-core operations also contributed to the unfavorable quarterly impact as compared to the prior year due mainly to the timing of reserve reviews. Boardwalk Pipeline’s net income in 2017 was affected by a $294 million net benefit related to the Tax Act. Absent this net tax benefit, net income in 2018 increased due to Loews now owning 100% of the company as compared to 51% in the prior year period. This increase was partially offset by lower net transportation revenues, resulting primarily from a contract restructuring and reduced rates on renewing contracts, offset in part by revenues from growth projects. At December 31, 2018, there were 312.1 million shares of Loews common stock outstanding. For the three months and year ended December 31, 2018, the company has repurchased 2.9 million and 20.3 million shares of its common stock at an aggregate cost of $135 million and $1.0 billion. From January 1, 2019 to February 8, 2019, the Company repurchased an additional 0.9 million shares of its common stock at an aggregate cost of $44 million.